Autumn Joy Sedum plant getting ready for fall at Bluebird Gardens. If I was stranded on a desert island and could only pick one plant, this would be it. Autumn Sedum "Joy" is a plant that transforms itself through the four seasons, remaining easy care even through record hot Missouri summer temperatures and drought conditions. Autumn Sedum "Joy" is easy to overlook in spring, when the plant develops rose-like greenery. By mid-summer, the plant becomes a larger bush with green, broccoli-like buds. The buds flower into a pink haze, finally deepening into rich bronzy-red. Even the dead flower heads have good winter effect. In rich soils, plants may be pinched in June to prevent floppiness. A classic perennial! One of my Autumn Sedums "Joy" in spring, forming rose-like leaves as the plant grows. By the time summer rolls around, the plant reminds me of heads of broccoli. The flower heads then bloom into lovely pink flowers. Autumn Sedum "Joy" beginning to bloom in Missouri mid-summer. A little Iphone micro-lens gave me this close up of the Autumn Sedum "Joy" flowers. So pretty! Close-up of Autumn Sedum "Joy" flowers in bloom September 2016 at Bluebird Gardens. By winter, Autumn Sedum "Joy" flower heads have dried to a rich cinnamon brown. I often cut the flower heads off to refresh my dried flower arrangements. 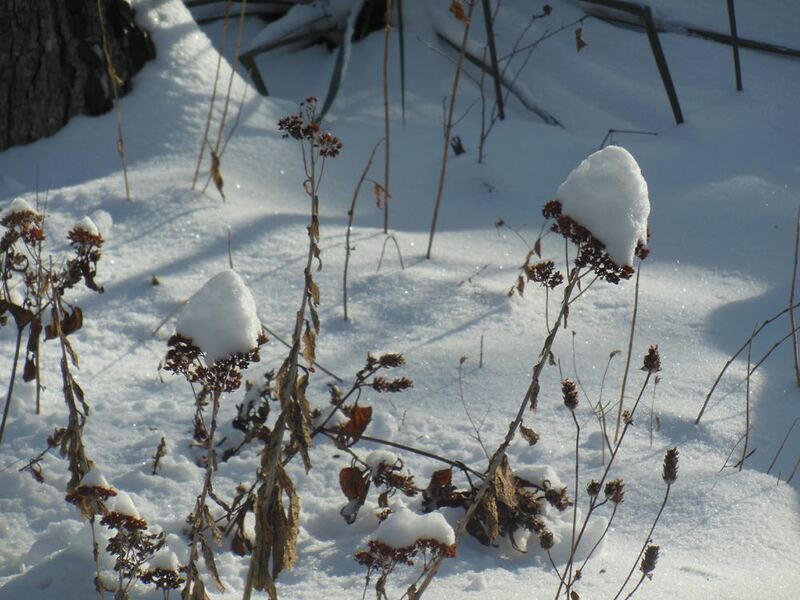 The ones that stay in the garden turn into what I call "snow flowers." Snow-covered Autumn Sedum "Joy" in winter suggests snow flowers, or so I call them. Autumn Sedum "Joy" requires almost no care. I have it planted in a variety of soils, moisture and light conditions and it's doing well in all of them. The only thing it doesn't seem to recover well from was getting trampled on when a beehive was temporarily parked next to one. Despite getting broken branches, that plant is recovering quite nicely! Do you have Autumn Sedum "Joy" in your garden?